The German president, Horst Koehler, has agreed to dissolve parliament and call a general election in September, removing a key obstacle to Chancellor Gerhard Schroeder's plan to bring the vote forward by a year. The BBC News website examines what lies behind the move. Why does Mr Schroeder want to hold general elections a year early? Mr Schroeder announced his plan to bring the elections forward in May, after the Social Democratic Party (SPD) suffered a crushing electoral defeat in the key industrial state of North Rhine-Westphalia - previously a party stronghold. He said general elections were necessary for the government to continue the reforms aimed at reviving the German economy. The tough reforms, designed to reduce the cost of the welfare state and make the labour market more flexible, have proven unpopular and triggered a wave of protests. How did he go about triggering early polls? 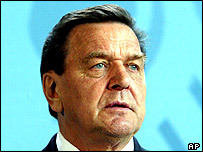 For parliament to be dissolved, Mr Schroeder needed to lose a confidence vote in the Bundestag (lower house). The chancellor purposely lost a confidence vote on 1 July, however under the German constitution, he still needed the president's backing. Mr Koehler finally agreed to dissolve parliament, saying that Germany faced giant economic challenges. "In this serious situation, our country needs a government that can pursue its goals with steadiness and vigour," he added. Are there any precedents for the confidence vote? Yes. In January 1983 the Bundestag was dissolved at the behest of then CDU Chancellor Helmut Kohl. He wanted a bigger parliamentary majority, so he deliberately lost the confidence vote in December 1982, then went on to win the election in March 1983. SPD Chancellor Willy Brandt also engineered elections in 1972 after losing a confidence vote he had called. Mr Brandt was re-elected, in a vote seen as a referendum on his policy of formalising ties with the Soviet bloc. But the German constitution, drafted in the 1940s after the defeat of the Nazi regime, was designed to ensure political stability and make early dissolutions of parliament difficult. The pre-war Weimar Republic had been plagued by feeble coalitions which failed to rein in political extremists. When will elections take place? Elections have to take place within 60 days after the dissolution of parliament, and Mr Koehler said they would most likely happen on 18 September. However, some experts say Mr Schroeder's move is constitutionally questionable and could mount a challenge. Green deputy Werner Schulz and SPD deputy Jelena Hoffmann are considering an appeal to the federal court, arguing that there are no grounds for the confidence vote. Will Chancellor Schroeder be voted back in? With high unemployment and the economy grinding to a halt, observers suggest Mr Schroeder could lose. Christian Democratic Union (CDU) leader Angela Merkel has a comfortable lead in opinion polls and her party is relishing the prospect of early elections. But the former East German communists, the PDS, could also gain votes from disillusioned former SPD supporters frustrated by the struggling economy and the welfare reforms. If Ms Merkel won, she would become Germany's first female chancellor, and be the first to come from the former East Germany.